The idea of researchers “collaborating” with a community is a common one, but Gerald Campano, Penn GSE associate professor of literacy and culture, believes that it is often a hollow term. His mission has been to create deep, long-term collaborations for community-based research that are a genuine and equal sharing of knowledge. The work of these rich collaborations has been time consuming, but the Penn GSE research team and the South Philadelphia families and youth they are involved with are beginning to be recognized for their labors. A book, Partnering with Immigrant Communities: Action Through Literacy, was awarded the 2017 Edward B. Fry Book Award by the Literacy Research Association on December 1. Additionally, the group has received a $400,000 Spencer Foundation grant, considered by many to be the most prestigious in the field of education. Yolanda Sealey-Ruiz, chair of the Literary Research Association award committee, and associate professor of English education at Columbia University, wrote the acceptance letter to the authors. “Partnering with Immigrant Communities advances literacy by focusing on the ways in which diverse communities cooperate across linguistic, discursive, and social boundaries in order to articulate a vision of educational justice and immigrant rights,” she wrote. The research collaborative is focused on improving education. Campano, whose own grandfather was a migrant laborer from the Mindanao region of the Phillipines, believes that the award is validating. “I am particularly proud of the book. It represents a lot of collaborative work over time with many people involved,” he said. The research described in Partnering with Immigrant Communities: Action Through Literacy is a mark of the richness of the Aquinas/Penn GSE collaboration. The book was written by Campano and María Paula Ghiso, an associate professor of literacy education at Columbia University’s Teachers College, in partnership with Bethany Welch, the director of the Aquinas Center. Welch said a critical component of the partnership has been the creation of a set of “equitable, ethical, and professional” standards for conducting research at the Center. A critical result of the collaboration is a list of a dozen “demands”—changes needed based on what families believe is essential to their success in education. 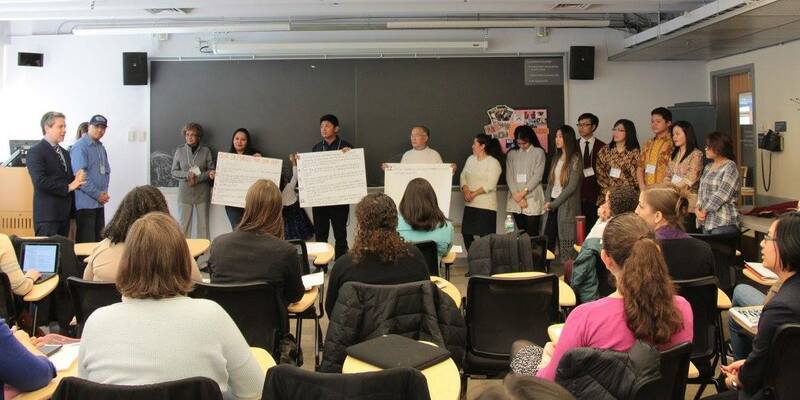 The parents and Penn GSE team have presented those demands in several forums over the past year, and are creating ways to reach more audiences in the future. The partnership with Aquinas started in 2010 through a “Penn Pal” project, with master’s students writing letters back and forth with Indonesian children in Sunday school at St. Thomas Aquinas church. “We did that for over a year before we started our research, just to build relationships with leaders and nurture trust,” Campano said. Through that project the Aquinas children and their families got to know the Penn faculty and students, but also learned about Penn the university, and the possibilities of a college education. Some of the children they started working with seven years ago are now in college. The Spencer Foundation grant, awarded to both Penn GSE and the Aquinas Center, will fund the collaborative work for the next three years. “The grant is to enhance and take to the next level the research we have already started with the community,” Campano said. “People are cooperating, building solidarity with one another, and addressing pressing social justice issues.” The grant funds to Aquinas already have made it possible to rewire the Center and acquire a new commercial grade server, computers, and other technology. “For the kind of community-based, participatory research we are doing, we have to have computers and speedy internet, all of which helps community members carry out the research and disseminate the findings to a broader audience of stakeholders,” Welch said. The grant funds the creation of a new website to showcase their research in the hopes that their learnings can be used to replicate community–researcher partnerships successfully, as well as a documentary film with an intergenerational cast explaining what the community has identified as its demands for change. The Spencer Foundation grant also allows additional graduate students to become involved, and will fund collaborations with quantitative methods researchers to create surveys in several languages in partnership with community members. Over the years, 15 Penn doctoral students have been involved in the Aquinas project, along with over a hundred master’s students, Campano said. Many have conducted research for their dissertations through their work with Aquinas. Current Penn Ph.D. candidates Grace Player and Emily Schwab co-wrote some of the chapters of Partnering with Immigrant Communities: Action Through Literacy. Other Penn doctoral students working at the Aquinas Center this year include Victoria Gill, Oreoluwa Badaki, Chloe Kannan, and D. Gordon Asaah, and master’s student Yared Portillo. Graduate students in Campano’s elementary literacy course are continuing the Penn Pal tradition with Aquinas Sunday school children. The team will continue to work with a core group of about 40 people from the many different constituencies at Aquinas on topics including educational equity and access. “They are networked with so many other people in the community, we could have breadth as well as depth,” Campano said. The partnership also started programs for adults. Schwab is in her third year of teaching adult English as a Second Language (ESOL) classes two nights a week, working with Aquinas staff. Open to all community members, the ESOL effort has grown from one class to three. Schwab, who also speaks Spanish, has been conducting research for her dissertation on adult learning in out-of-school spaces. “I have a commitment to working with community members as co-researchers,” Schwab said. Grace Player, now in her fifth year of her doctoral studies at Penn, has been working with middle and high school students from immigrant backgrounds on a writing and research project alongside other members of the research team. They meet once a week, on Saturdays. Player’s research for her dissertation is based on a writing group she created for girls of color, documenting how they used literacy to examine social issues, such as racism and sexism. Looking to graduation this spring, Player hopes to find a job in academia, working with communities. “I want to continue this legacy that bridges the university and neighborhood institutions,” she said. Player will become one of several Penn doctoral students who have been shaped by the experience with Aquinas.